Biokat's Duo Active Fresh clumping litter has a pleasant baby powder scent. The litter is made from 100% natural clay and plant fibres. These fibres absorb odours which clay can't. And this litter is up to 50% lighter than conventional clumping litter and very effective, binding up to 100% of nasty odours. Duo Active Fresh litter is very absorbent and forms solid clumps. It is made using only the very best, natural materials. The clay comes from local, controlled open pit mines and geologists make sure that the natural balance of fauna and flora is maintained. Biokat's works together with conservationists to ensure that the excavated areas are then reclaimed and cultivated to create valuable habitats and forests. 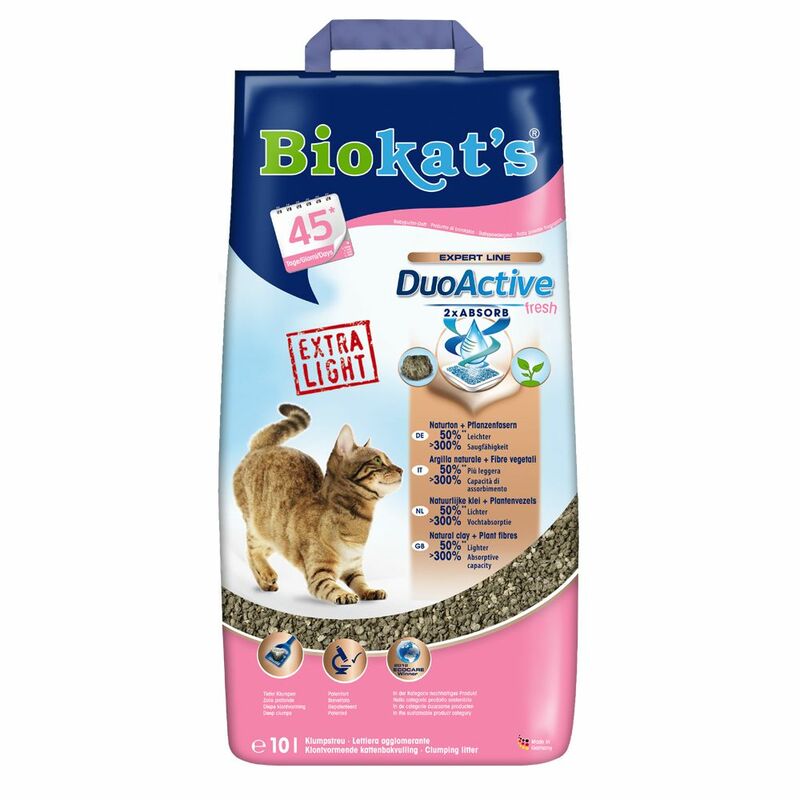 Biokat's Duo Active Fresh cat litter at a glance: Made in Germany 100% natural clay and plant fibres With Baby Powder scent Binds up to 100% of odour: Plant fibres absorb any smells which are not absorbed by the clay The clay and fibre mix is up to 50% lighter than traditional clumping litter Up to 100% firm clumping action Can be used up to 60 days Only made with premium, natural materials Winner of Ecocare Award 2012 Made only using natural clay from local controlled open pit mines.